Arches National Park is unique at every turn. No matter how many times you drive or walk through this giant rock collection, you usually notice something different. Located near Moab, in Southeastern Utah, this beautiful red rock country is overflowing with unusual rock formations. This is called the High Desert as it is located between 4,000 and 5,600 feet above sea level and receives very little precipitation. There are 36 miles of paved road going through Arches National Park, and you can see many of the formations at a distance. But there seems to be a desire within to take a hike, and actually touch some of these famous landmarks. Over the years many arches have collapsed due to erosion of wind and water, but there is still a plentiful feast for your eyes here. Delicate Arch was used in 1996 as a symbol in Utah’s centennial celebration and is the park’s most famous feature. While it is a beautiful tribute to the National Park, it is not easily accessible. 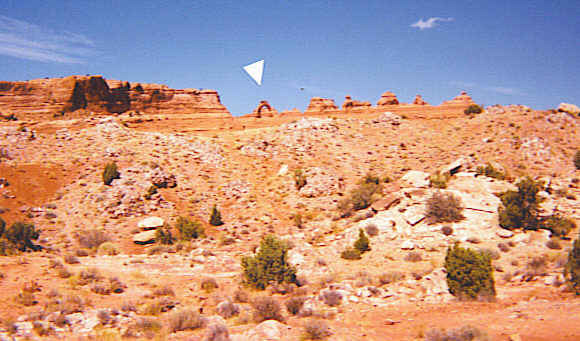 The opening close up view is spectacular, but you can see from the arrow in this photo how high and far it actually is located from the main road. 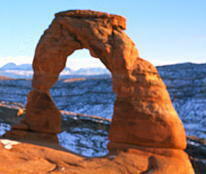 Spring and Fall are definitely the coolest times to take the hike for an up close and personal view of Delicate Arch. You really can’t appreciate its beauty from afar. The Windows is another popular photo spot. Here you can see how vast the opening really is when compared to the size of the visitors. At a double arch in The Windows area, filming of the beginning of “Indiana Jones and the Last Crusade” took place back in 1988. With all this rock, it might seem animals would be few and far between. However, there are many nocturnal creatures living in this desert region, including many different varieties of birds, mammals, reptiles and amphibians. Perhaps there are some snakes and rats left over from Indiana Jones! Water is their biggest problem, and while the Colorado River runs on the park’s southern boundary, it is too far away for most of these creatures. So they have developed various ways to adapt. This group of rocks got its name, Garden of Eden, because early park visitors let their imaginations loose and thought the rocks resembled Adam and Eve, holding the tempting apple. There is even a small ten foot Serpentine Arch here to complete the Garden of Eden scenario. This Estrada sandstone gives a special color to the area. The view frequently changes as the sun moves in the sky casting shadows and glows in different directions. 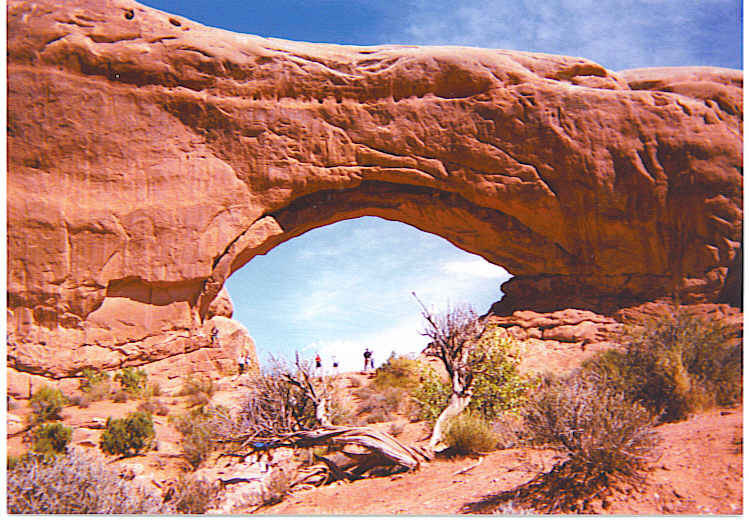 With over 2000 natural sandstone arches and unusual rock formations, Arches National Park gives you a new appreciation of the beauties of nature. You’ll find nothing man-made here. “Only God can make a tree”…or a beautiful rock formation!